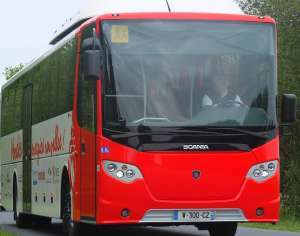 Europe’s first Euro 6 coach for gas operations, Scania OmniExpress 320, is presently being tested in the French county of Vendée, along the Atlantic seaboard. The bus is fuelled by locally generated biogas, which is produced by ten farmers at four farms. They have produced biogas since April 2014, which is injected into the gas network of the city of Mortagne-sur-Sevre. Initially the bus will be used on a 30-kilometre school route and subsequently be put in operation on a regular 200-kilometre line. The bus seats 55 passengers and has space for one wheelchair. 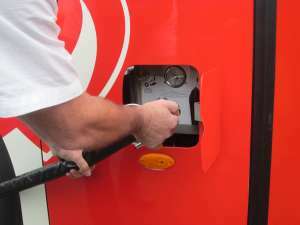 It carries eight 150-litre gas tanks, which is sufficient for a 500 kilometre journey.